Michihiko Shoji, the inventor of the Virtual Humanoid 'U-Tsu-Shi-O-Mi' has a talk on NEXT, in Denmark, on April 4th and has a space for discussion in the exhibition on April 5th and 6th. The distribution on the exhibition venue is here . The full experience movie of U-Tsu-Shi-O-Mi is here and you can see how it works on here. Click here to see a diagram of it. Shoji moved from NTT DoCoMo Labs to Yokohama National University in 2007. He demonstrated the system developed at NTT DoCoMo at ASIAGRAPH 2007 in Tokyo, October 12-14, 2007. He is now seeking new sponsors to continue the project. 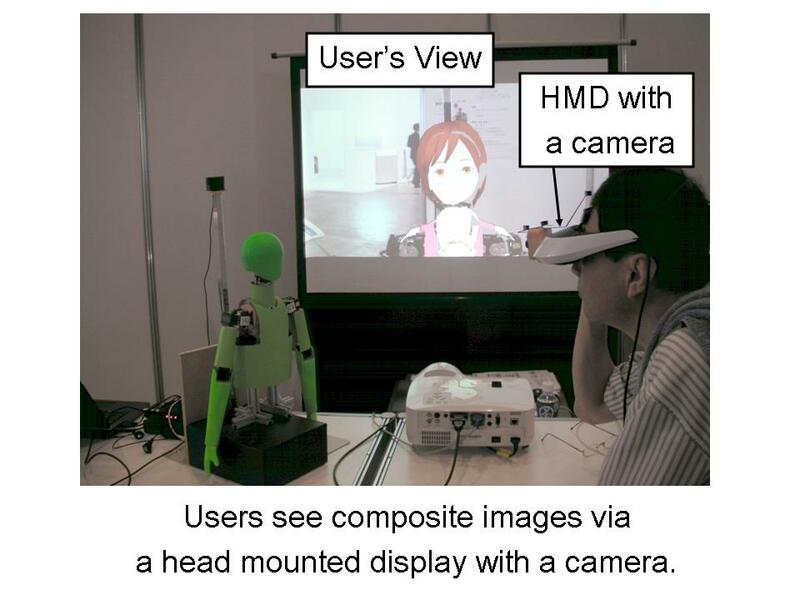 Virtual Humanoid "U-Tsu-Shi-O-Mi" is an interactive "mixed reality" system that lets you be able to both see and touch virtual 3D characters. The system consists of a special headset, a synchronized pair of a robot and virtual 3D characters. 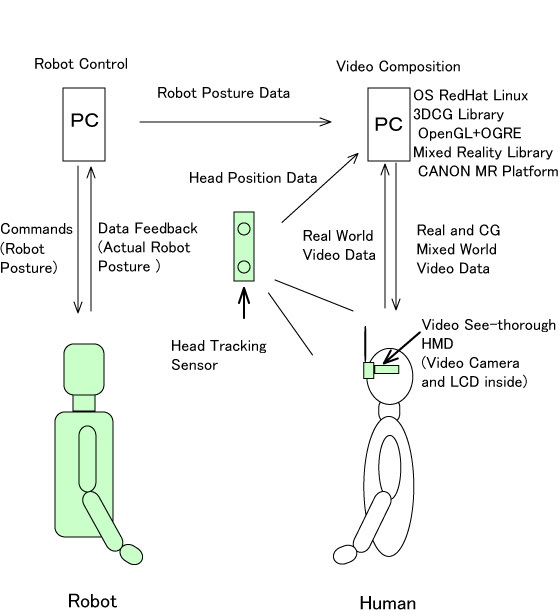 When you put the headset on, you will see a computer animated human overlaying the featureless robot.The headset has a pair of video cams in it, and the images captured by the cameras are transported to a PC which makes composite images of real and virtual world together in real-time. Then, through the headset, a mixed reality world can be seen. In addition, when you shake the robot's hand, the images follow the robot motions because the command which drives the virtual character is based on the data of the robot's joint angles. Using U-Tsu-Shi-O-Mi with AI , you will be able to invite your favorite stars to your living room in the future.